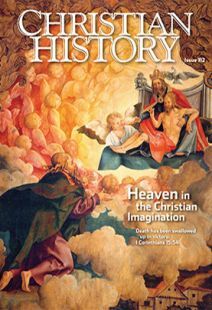 Those words of Scripture came back to me often as we worked on this issue of Christian History about heaven. We have been hoping to do an issue on heaven for over three years, ever since we released the History of Hell guide in 2011. Many of you who found the Hell guide useful and thought-provoking have been eager to see us talk about heaven in the Christian tradition. We are glad to finally be able to show you just a sampling of the incredibly diverse art, music, stories, descriptions, musings, and theological reflections Christians have come up with over the years as they tried to express beauty that is ultimately inexpressible. For that is, of course, the problem with heaven. None of us have been there. That has not stopped many thinkers, writers, artists, and composers from trying to picture what heaven might be like and who its inhabitants might be. Building on biblical imagery, heaven has been seen as a garden, a city, a home, a community of saints, and even a starry night. And theological debates surrounding heaven (and hell) have echoed through the centuries. Who goes to heaven? How do you get there? How central is the idea of heaven to the Christian faith? Will everyone eventually end up there, or will some remain in hell? (We covered that particular debate extensively in the History of Hell guide.) What will the experience of heaven be like? Will we be able to recognize our friends and loved ones as we did on earth? Is there any kind of intermediate state before we get there? How does heaven relate to Christ’s Second Coming and the setting up of a “new heaven and a new earth”?